While many are looking for All On 4 Dental Implants Clinic for aspiring to have a bright smile that reveals shiny white teeth that will enhance self-confidence and will be a weapon of success in life, there are still those who adopt habits that destroy their teeth. These patients will soon discover that these habits are very dangerous because they make the enamel layer thin making it easily exposed, decayed or lead to erosion of the protective enamel layer. The tooth enamel is a thin layer covering the visible part of the tooth, and rich in minerals, and protects the ivory layer surrounding the heart of the tooth. The translucent enamel allows light to pass through it, hence the appearance of the beautiful natural ivory color beneath it. The destruction of tooth enamel is manifested in various forms, including allergies to hot and cold foods and beverages, discoloration of teeth, and the appearance of caries, cracks, and cavities, which affects daily life. Teeth sensitivity and gingivitis are one of the most painful things we experience, however, we are not aware that our diet and bad habits are reflected negatively over our teeth with time and should be minimized so that dental and gum diseases do not appear. Soft drinks(soda or fizzy drinks)are one of the most popular drinks of all ages, especially the youth, which is characterized by the variety of flavors, and taste delicious, sweet, and accelerate the process of digestion, which gives a sense of comfort. But they are causing damage to the body that many people do not know, because of the constituents it is made from. 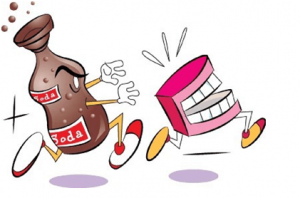 Why soft drinks make you lose your teeth? Soft drinks contain a high percentage of sugars that destroy human health over time. It also contains carbon dioxide, which causes the body to suffer from indigestion, and damages the yeast in the stomach, and contains a large percentage of caffeine. While we are looking for shiny white teeth, we make lots of mistakes that are harmful to the health of the teeth and may cause allergies and erosion. Soft drinks dissolve the outer layer of the tooth because it contains a high proportion of acids in the composition, which increases the likelihood of tooth decay two times more than sugars in sweets. Drinking too much soft drink can cause tooth decay and increase the chances of exposing teeth to allergies, this not only applies to soft drinks but sports drinks, and energy drinks. Soft drinks or fizzy drinks are very acidic, and the acids in them can damage your teeth and gums more than sugar by removing the minerals from enamel, so sugar-free soft drinks are still very bad for your teeth; they contain citric acid and phosphoric acid that will cause dental cavities. Although sports drinks look healthy, they are full of sugar and acids, and the chances of caries and erosion are very important. Sports drinks compete with soft drinks and energy drinks, which are among the most acidic drinks available. Energy drinks are higher acidic compared to sports drinks, so those beverages cause tooth decay quickly and work on inflammation of the gums. In brief, tooth protection begins by protecting the enamel layer that surrounds it, by avoiding sugary foods, not drinking too many sugary drinks, eating well-balanced nutrition, good oral hygiene care, and avoiding harmful practices that harm the tooth enamel. This blog article reveals to you the unexpected surprises from the soft/fizzy drinks you drink constantly while having no knowledge of its side-effects on the gums and teeth. But this does not prevent you from drinking them but should be reduced to some extent, and make sure to clean and brush your teeth after drinking them.